Christmas Moss is as mysterious as some of the other mosses in the aquarium hobby. There is no consensus on its geographic origins and even the scientific name has a tendency to change. Its growth habits and appearance are just as varied. When grown attached to a piece of driftwood or rock, it forms triangular fronds in the shape of Christmas trees (hence the common name). If allowed to grow free floating, it tends to have a much less organized appearance and the triangular fronds are much less pronounced. 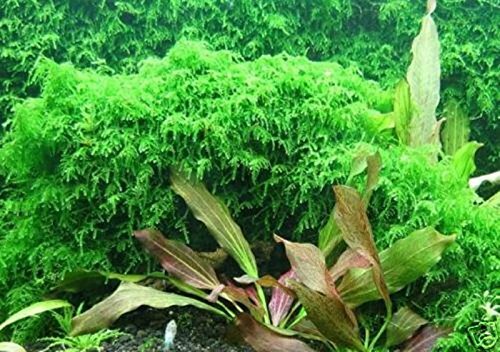 In this form, it is often confused for the much more common Java Moss. In lower light, it grows much less densely, and again, is often much less organized in structure. Only under higher light conditions, attached or anchored to an object, does Christmas Moss show its true structure. It will form a pillowy bush of triangular fronds that is very attractive and undemanding. If you have any questions about this product by Polar Bear's Aquarium, contact us by completing and submitting the form below. If you are looking for a specif part number, please include it with your message.